IVF labs have been routinely freezing sperm and embryos for many years. However, freezing eggs have always been a challenge. This is because the egg is the largest cell in the body and contains a large quantity of water. Using conventional slow freezing techniques would mean, that this intracellular water would often form ice crystals while the egg was frozen, resulting in the egg being damaged. However, using a new technique called vitrification (Vitrous=glass) or flash freezing, we can now reliably freeze eggs as well. The principle is simple. This new method of cryopreservation allows ultra rapid freezing. We put the eggs in very smalldroplets of vitrification solution in special straws and plunge them directly in liquid nitrogen. This means the egg is cooled from 37 °C to -196 °C in a few seconds, so that the water does not get a chance to crystallize. Vitrification uses a very high concentration of antifreeze solution (DMSO and ethylene glycol), allowing instant super cooling into solid with no ice crystal formation at all. Of course, it is not quite as simple as it might sound. Such high concentration of antifreeze could be toxic to cells. This is why technical skill, expertise and experience is critically important!Using this vitrification technique for freezing, we can reliably preserve eggs so that the pregnancy rate is as good as with fresh eggs. 1. Formation of donor egg banks to facilitate and lessen the cost of oocyte donation. 2. 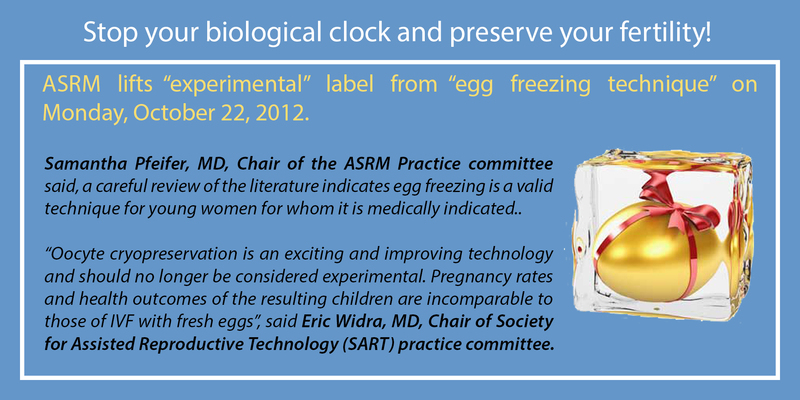 Provision of egg cryostorage for women who wish to pursue their career and want to postpone childbearing. 4. Fertility preservation for cancer patients before chemotherapy and radiation therapy. 5. During IVF treatment when sperm are unobtainable. Day 1 : Base line sonography andDay 2 : Inj Menogon (75 IU), 4 amp IM. - Superovulation starts. Vaginal ultrasound scans are done to monitor follicular growth. The antagonists and Menogon injections will continue on a daily basis; and scans will be performed every alternate day, until the follicles are mature. This is usually Day 10- day-12 for most patients. At this time, an HCG injection will be given and eggs retrieved 36 hours after this.The eggs will then be vitrified. You can travel back 2 days after egg collection. Lots of women have many questions about egg freezing. Here are some common questions we are asked and theiranswers. Q1. How do you check that the eggs are normal? Do you do that before freezing or before/ after fertilization? I’ve heard of a higher rate of problems in babies born of older women. Is it possible to ‘check’ eggs for that? Ans:No, sorry, we still cannot check if the eggs are genetically normal. Q2. What are the possible side effects of the egg retrieval treatment – long term and short term? What is the likelihood of getting these side-effects? Ans:There are no long term effects at all! We use hormonal medication to super ovulate you, but these are natural hormones which get excreted promptly. The treatment will not cause you to run out of eggs either – it just allows us to save eggs which would have died (undergone atresia) anyway. Q3. Have any babies been born from frozen eggs in your clinic? How many women have frozen their eggs? Can I possibly talk to anyone who’s undergone this procedure? What is the success rate of IVF and egg freezing at your clinic? Ans: Our patients want us to protect their confidentiality! However, this is now a pretty standard procedure used by clinics all over the world. Q4.What are the general chances of success – having a baby someday- with this procedure? Ans: This is a complex question and the answer depends upon how many eggs you grow. Q5. If I do want to have a baby at the age of 45, would I be having it myself, or need to use a surrogate? Ans: You can have it yourself – your uterus remains young forever! Even after the menopause, your uterus is able to support a pregnancy! Q6. How would the eggs be retrieved? Would it hurt? Ans: Retrieval is done under general anesthesia. It takes about 15 minutes. There is no pain. Q7. Is it necessary to get screened for sexually transmitted diseases before doing the procedure? Q8. How many years would the eggs remain viable after freezing? Ans: As long as you want- we store them in liquid nitrogen. Q9. How much would the procedure cost? What would be the approximate cost of the medicines required? What would be the cost for keeping the eggs frozen per year? Ans:Our charges for freezing and storing eggs for the first six months is USD 3200 only. This includes all medical treatments and procedures. Storage charges for every 6 months will be USD 200 only.